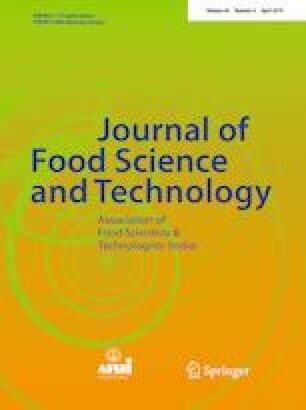 The effect of harvest periods on total phenol, antioxidant activity, individual phenolic compounds of fruit and leaves of Tavşan Yüreği, Memecik, Edremit, Ayvalık and Gemlik olive varieties grown in Turkey were investigated. The highest total phenol (317.70 mg/100 g and 2657.81 mg/100 g) were observed in Tavşan Yüreği olive fruit and Ayvalık leaves harvested in December, respectively. The highest antioxidant activities (83.84%) were determined in Edremit fruit harvested in August and 83.33% in either Edremit olive leaves harvested in November and Tavşan Yüreği leaves harvested in December. The olive fruit contained gallic acid ranging from 7.18 mg/100 g (August) to 35.85 mg/100 g (December) in case of Ayvalık and 2.09 mg/100 g (November) to 21.62 mg/100 g (December) in Edremit. Gemlik olives showed higher gallic acid contents compared to the other varieties, however it depended significantly on harvest time in all cases. 3,4-Dihydroxybenzoic acid contents ranged from 33.11 mg/100 g (October) to 25.17 mg/100 g (September) in Memecik olives; 12.17 mg/100 g (August) to 33.11 mg/100 g (December) in case of Tavşan Yüreği olives depending on harvest time. The 3,4-dihydroxybenzoic acid contents of Memecik leaves ranged between 122.25 mg/100 g (September) to 196.58 mg/100 g (August) and that of Tavşan Yüreği leaves changed between 99.38 mg/100 g (November) and 179.90 mg/100 g (August). The leaves of these two varieties contained significantly (p < 0.01) higher 3,4-dihydroxybenzoic acid contents than other varieties. The highest gallic acid (144.83 mg/100 g) was detected in Memecik leaves (September) whereas lowest were found in Gemlik leaves collected in October. The authors would like to extend their sincere appreciation to the Deanship of Scientific Research at King Saud University for its funding the Research Group No. (RG-1435-049).